It turned out to be a all cousins affair with us and Jayanti being the non cousins in the group of thirteen that we put together to go. Sreesha and Krupa and Keshu managed the planning and logistics and we rest provided the mass. Start of the trip was eventful with forgotten tickets, and a Swiss knife in the hand bag and credit card that was not there. The tickets were re printed. The knife was checked and the booking lady confused. And this was just the beginning. They say, patience needs testing for the character to be built. And the test was round the corner. We flew from Bangalore to Delhi ( after those colorful events and an in-flight cold sandwich). We managed the next leg to Haridwar peacefully. Bright , early and sleepy we set out for the next leg on the bus and got to see once in a life time “Shiv Kavad Yatra”. For the Kavad, people are supposed to take the Ganga water, walk bare foot till their respective villages and pour it all on the respective local shiv temple. The whole of North Indian village temples made it a point to send their troops for our special viewing. These bunch got innovative and modern. They got big trucks, pumps, drums and music sets and caused a 10 hour traffic Jam. Our characters got built big time. At first we were merrily taking photos and vedios and then saw the traffic night mare created by thousands of trucks carrying holy water. To add to it this was the last day of Savan, so very auspicious to take a dip. There were hundreds of 100cc s competing with the trucks, from the opposite direction. We were brave. So we decided to take the traffic in our hands and discipline the unruly. It took us 4 hours to realize traffic has its own will and when it wants to Jam it will. Having navigated 5 kms in 10 hours and a late lunch, we went to Rishikesh, saw the Ganga again and felt good about passing the patience test. 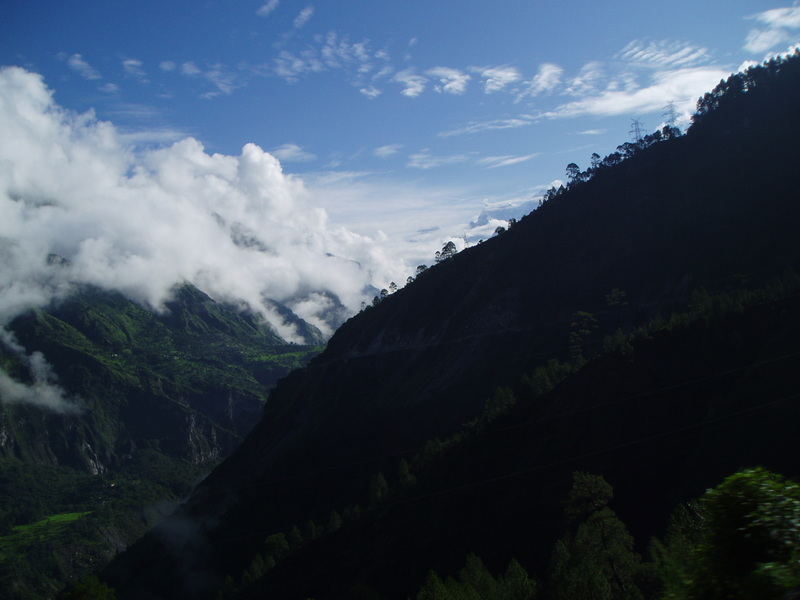 Next day we made another early morning dash to Govind ghat. Why ? Because there is a gate there that allows the last bus to go thro at 4:00 pm and we are a motley bunch who like to take breaks and the roads there are fickle minded. 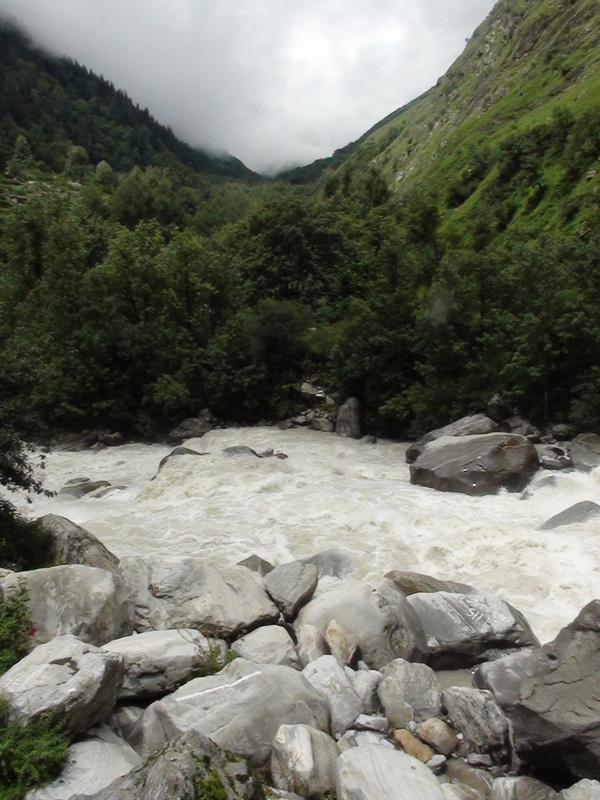 From Govind ghat made our way to Badrinath, Valley of flowers will have to wait. Badri Vishal needs a visit. 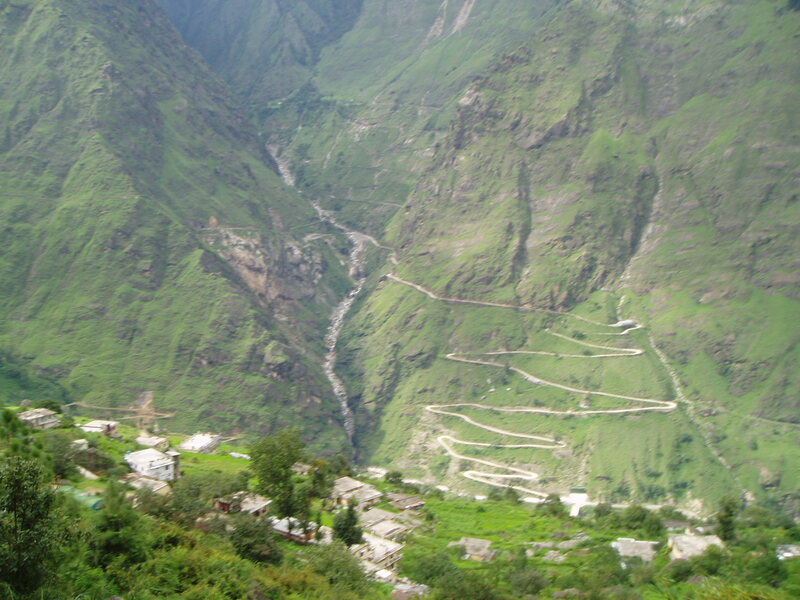 The winding road with the river in the background showed why Himalayas have the magic in them. The mountains, the forests and the streams immerse you and make you forget the normal. And then there is water. Water as clouds. Water as drops not yet dried on the leaves and flowers. The water in the rain/drizzle. 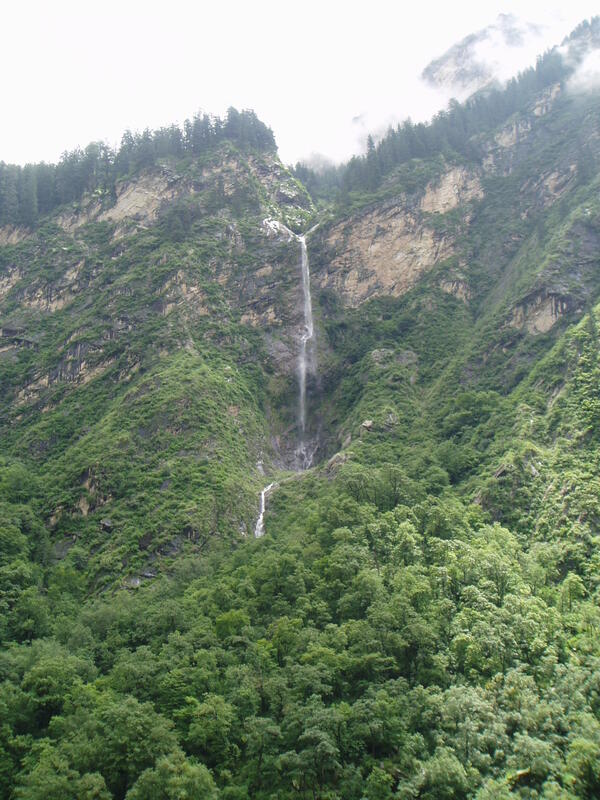 Water flowing at the side of the road, water in the laughing impatient streams, falling in a cascade of white tresses on the face of the mountain. Water in all forms. Ever impatient. There is a hurry to all that water. It just wants to flow down, tumble and form bigger mass. Roar, hiss, gurgle. Impatient. The rolling mass wants to become a Bhaghirathi, An Alknanda and the Ganga. From the drop to the river it is all about running here in the mountains. Why? To meet the ocean in the bay of Bengal ? To evaporate and start all over again ? The mountains themselves are impatient like the young. There is beauty. There is life teeming all about it. Trees. Plants. Flowers. Birds. Bees. And there is the destruction. Water making the earth heavy rocks giving way. Breaking rocks with no concern and leaving a train of debris. The land mass itself aggressive tecktonic. So much insight already on the way and the Vishal Badri was still to be seen. 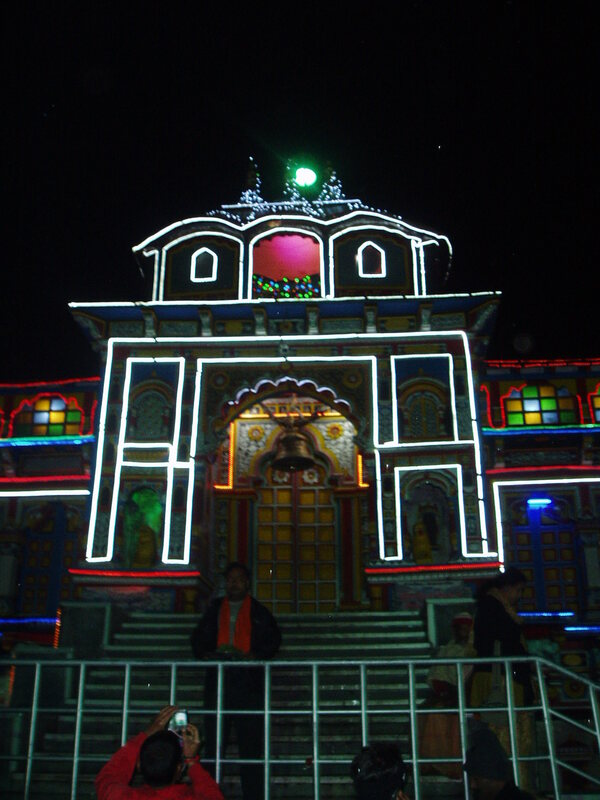 Darshan at night. Very nice. Pose. Click. Get wet and go to sleep. The GMVN guest house here is nice. Good, clean rooms, decent food. Next day back to the gate and drive to Joshi math. The route was treacherous and spectacular. Both of them make you bit more spiritual. The trek to the Valley starts at Joshi math. It is 15 km steep-ish climb to the base Gagharia. The Ganga or rather Lakshman Ganga gives a constant company. We passed through the narrow lanes in the rain to the start of the trail. The temple towns have these lanes with shops at the side that are touristy and saffron-ish ting to them. If you have for gotten some thing this is the best chance to catch up. Few of us bought the ploythene rain coats ( in the hind sight just a good cap would have been ok) Me, Wify and dotty dears had got ours from the Chamraj peth earlier. I had a bright pinkish orangy one for better visibility. the kids and the bags. If you are young and in nice shape and do not mind a 10+ kg load it is fine. Otherwise getting help is a good idea. Dotty dear looked at the basket and the pittho man and sulked. She had seen some old granny in it earlier and made up her mind to show “her” age. Luckly Pranav, the other kid, in the group apart from me provided the motivation and both settled down in the basket. A steep uphill, 5 minute walk helped. 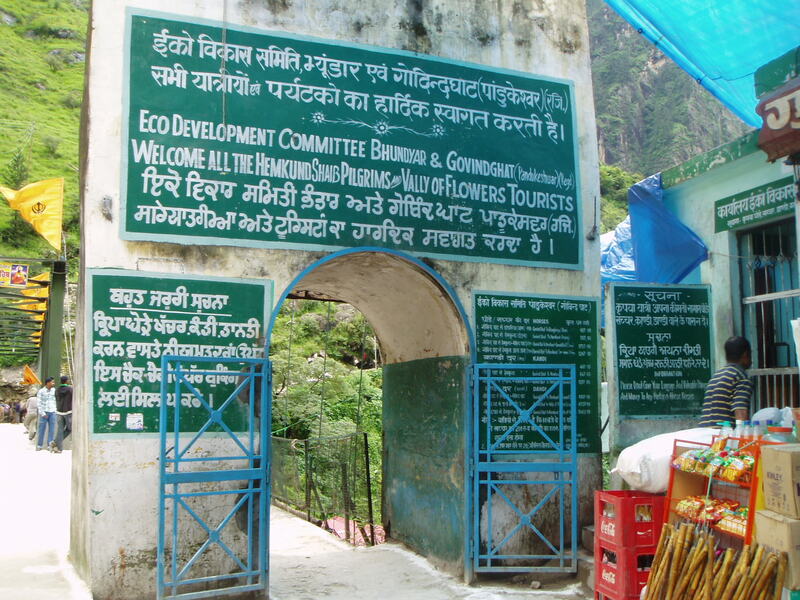 The trek up is full of piligrims to the Hemkund (a pretty lake where Guru Nanak meditated). And mules. And Dhabas selling nimbu pani, Maggie, Parathas and glucose. And then there is the mule dung. The mules are very productive and their dung omnipresent. As we climbed, the un worked muscles complained. The group splintered. There were the fit folks who matched pace with the pithoos. There were the “I trekked long time backs” who talked more than walked and then there were the “god what made me come here” types who trailed. We had got this trip arranged by an agent and he gave us a guide. The guide encouraged the oh gods and soon we all found our own means to deal with it. The views become better and slowly a rhythm developed to the gait. Breaths were getting paced. Flowers were emerging. Already. And we learnt the mule lesson. 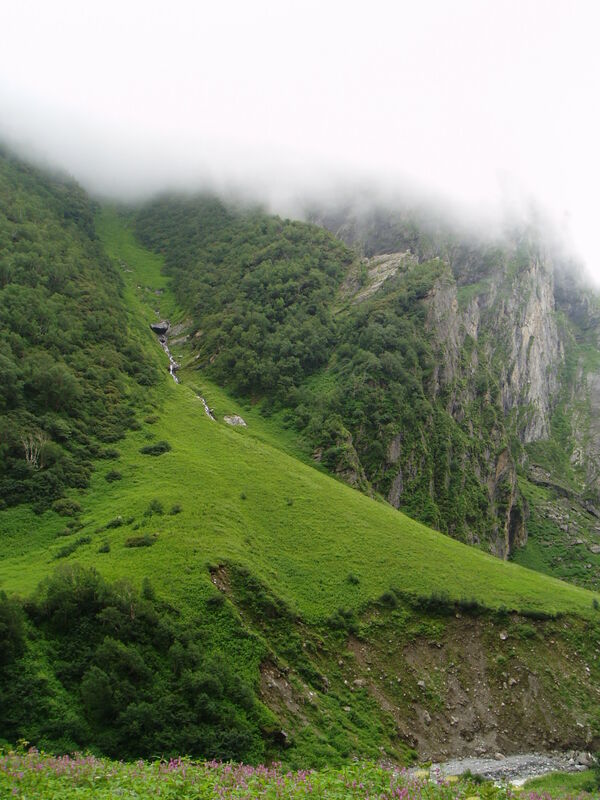 The path in the mountains is winding and curving. Mules always like the outer rim. If you wait there the mules will knock you unless you wave a hand or a stick. Best stay in the inner part of the curve. Mid way through the climb the left leg twitched and threatened to cramp. I went oh god. Couple of careful Kms later it cramped. Luckly I got help and back on feet and the trek. A slow progress and a hot maggi stabilized things. The group with Pitthos and the kids reached Gangharia. I limped slowly and peacefully. The last group appreciated the flowers and themselves. Checked into an average hotel and thought of the actual Valley trek for the next day. Thanks dude. This was interesting knowing. Nice travelogue Srini. I went there some 14-15 years ago and all the memories are still afresh. I live in Bangalore and like doing a little bit of most of the stuff. I trek, travel, drive and ride, read and write, teach and do a tiny bit of carpentry lousily. Self development by way of self awareness.